In our effort to bring you the best family experiences the Niagara region has to offer, we’re getting up close and personal with local events and attractions. 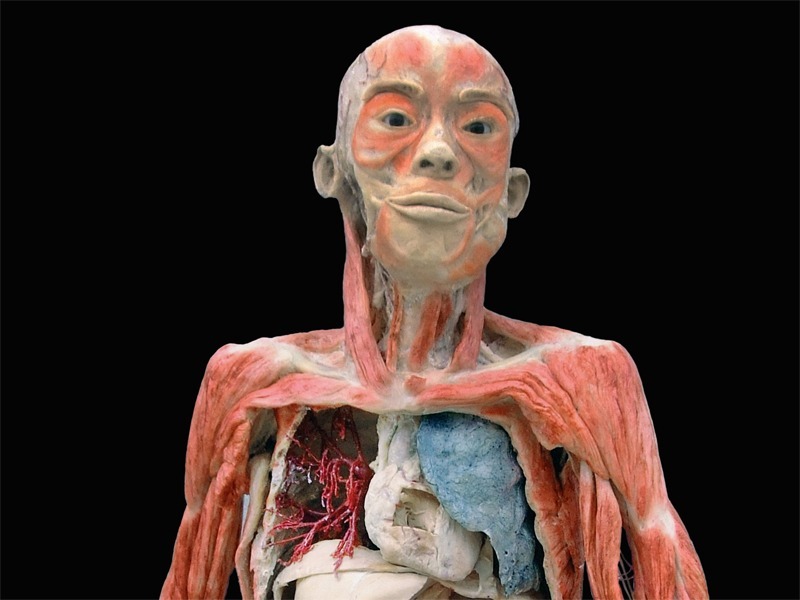 It doesn’t get much more up close than a look at the human body from the inside out at the newly opened and fascinating Bodies Revealed exhibit in Niagara Falls. My older kids, both girls, are 8 and 10 years old. We moved to Niagara in July and have been homeschooling this year while we decide on a new school. It just so happens that we’re currently embarking on a study of anatomy and biology, and it just so happens that this exhibit opened at the Four Points Sheraton in the Falls in February. The idea behind Bodies Revealed isn’t new. Gunther von Hagens is the scientist who first invented plastination, the process of preserving living tissue with polymers. His ground-breaking Body Worlds exhibit was the first of its kind, and continues to tour the world today. Niagara’s Bodies Revealed is a more simplified take on this idea, but impressive nonetheless. I’m a nerd, I’ll confess. I’ve been fascinated by the body since I was about 7 and began worrying about how everything inside me just “knew” how to work. I went into Bodies Revealed knowing I’d enjoy the exhibit, but I wasn’t sure about what the girls would think. My hubby and our 18-month-old came along for the trip too, but upon entering we realized the exhibit was no place for a toddler. I wish someone had warned us. Many of the bodies were in the open, on small pedestals, easy to reach for curious little hands. It’s one thing to break a fragile item in a gift shop, but to knock over a plastinated human body? I don’t have pockets deep enough to cover that kind of accident. Daddy promptly had to turn around with our little guy because we weren’t allowed to bring a stroller in. To their credit, Bodies Revealed does mention the no stroller policy on their website, I just missed it. Whoops! One of the exhibit employees (you’ll know them because of their white lab coats) set us up with audio guides, which the girls decided were super cool. There are two tours available – one for adults, and one for kids. We opted for the kids’ tour, naturally. The girls were a bit disengaged until we became toddler-free and I could explore each display with them. They weren’t the least bit freaked out by the bodies, or the body parts. They didn’t giggle at anything except my bad jokes, and I found that engaging them in questions or discussion after each little blurb from our audio guide really helped to round things out for us. By the time we finished the exhibit, which took about an hour (after we subtract the insanity of trying to deal with our toddler and then an epic visit to the gift shop), neither girl wanted to leave. They both filled out comment forms and they asked the most interesting questions on the way home. I was impressed, and a little surprised, that they were as into Bodies Revealed as they were. I loved it, and could have spent more detailed time exploring, but I was worried they’d get bored, or that our now-napping toddler would wake up. I’d say this exhibit is most appropriate for kids ages 8 and up, who aren’t sensitive about a really raw look at anatomy. If you aren’t prepared to engage your kids, or encourage them to ask the staff questions, they will definitely be bored, but with the right mindset, this exhibit offers a truly unique experience – one that documentaries and books can’t quite capture. Try to get your hands on either the family or teacher’s guides (click the orange links to request those) and prep your kids in advance. These guides are wonderfully comprehensive, and you can turn the experience into a fun game, as there are some great activities included in each of these resources. Skip the audio tour of the reproductive organs if you haven’t yet talked about how babies are made. The audio guide talks about sperm and eggs and fertilization, though it doesn’t go so far as to explain how sperm and egg meet up. Our girls are savvy with the birds and bees chat, and were frankly delighted when there were FINALLY some female parts, because all of the bodies up until that point were male. Bodies Revealed does not have any kind of fetal exhibit. The staff explained this was because they didn’t have the square footage to house this part of the installation, as this particular aspect requires a separate room. They also mused a bit on how seeing plastinated babies at each stage of development can really affect people emotionally. No kidding. I’m sure it would have brought up some incredible questions from my kids, but I think they also would have been moved and amazed by seeing this. Not for everyone, to be sure, and not an issue in this case. The closest we get at Bodies Revealed Niagara is the look at reproductive organs mentioned above. Take advantage of reduced ticket prices. At $35 a pop for general admission, the price of this experience really adds up. There are currently deals available at Travel Zoo, so enjoy! If you’ve seen Body Worlds, Bodies Revealed will be quite a different experience. Expect something more in line with an anatomy lab, and less like an art installation. There are also no animals included in the Body Worlds exhibit. Bottom line – worth it if your kids are mature enough to handle the graphic display of anatomy, if they are into science and the human body, and if you can afford the ticket price and/or take advantage of the deals available. Bodies Revealed runs until October, 2014. The exhibit is open daily from 10 am – 10 pm. There is a no food, drink, photography, cell phone, back pack or stroller policy in place. I would also suggest no toddlers.